In this day and age, running a successful business requires quite a balancing act. Do I hire new employees, subcontract the work out, or hire an independent contractor? In talking with OC clients and prospects, I can tell you it is probably the most talked about item we go over when discussing Orange County CA general liability insurance, since many businesses are turning to freelancers or independent contractors in an effort to keep their costs down. Recently, I was working with a client on his renewal paperwork, and we were going over what coverages would be needed the following year, what he estimated his upcoming gross receipts would be, total payroll outside of his salary, and what subcontractors costs would be, so we could estimate what his renewal insurance would run. The client informed me that he had no employees because he hired independent contactors and simply 1099ed them, so he wanted them to be considered as subcontractors and to be priced accordingly. I pointed out that while I understood the reasons why he didn’t want to put them on his payroll, because he would be paying for things like workers’ comp, unemployment and payroll taxes, which would increase his costs of doing business, I also informed him that we would not be able to insure his CA independent contractors because, in most general liability policies, they are excluded. I could see the puzzled look on his face; he assumed an independent contractor was treated the same as a subcontractor, and nothing could be further from the truth. For many policies, the rate is based not only on sales, but payroll costs, and insured subcontractor costs. To give you an example, having an employee usually is three to four times the rate versus hiring an insured subcontractor based on the fact that with an employee, there is more risk than subbing it out to an insured subcontractor, because his insurance would come first in the event of a claim, and yours would be secondary. To put this in its simplest terms, either they are an employee of the company, or the person you want as an independent contractor has their own insurance. In addition to insurance companies looking at the role of independent contractors, state, and federal government agencies have been taking a very serious look, in the past few years, on how businesses treat independent contractors. According to government reports, the workers who are most misclassified are construction workers, high-tech engineers, home health care workers, and truck drivers. As a Orange County business owner, you should be aware of what the penalties can be for any misclassification of the independent contractors you may use. You could be liable for back payroll taxes, unemployment taxes, workers’ comp, and possible fines as well as any overtime you may owe. It is our suggestion that if you are going to hire an OC independent contractor, you consult with an attorney who specializes in employment related practices to prevent a surprise bill from state or federal agencies. 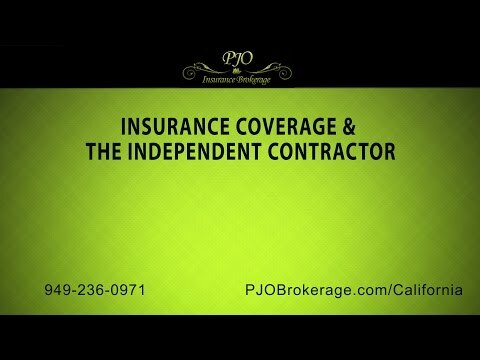 With regard to your insurance, please do not hesitate to call PJO Insurance Brokerage in Orange County, California with any questions you may have concerning your insurance and independent contractors.